State officials have decided to give up on trapping Willamette River sea lions and transition operations to Bonneville, where the Oregon Department of Fish & Wildlife already has federal authorization to trap and kill sea lions. "It's disheartening given what's happening in the Willamette, but we don't have enough staff to cover both locations so we're moving to a place where we can be more effective," said Bryan Wright, head of ODFW's Marine Mammal Program, in a press release this week. In the absence of federal approval to kill California sea lions at Willamette Falls, ODFW attempted a stop-gap program of capturing and relocating sea lions this spring. "It's our responsibility and mandate from the people of Oregon to ensure these fish runs continue," said Dr. Shaun Clements, ODFW's senior policy advisor. "So it's incredibly frustrating to us that federal laws prevent us from taking the only steps effective at protecting these fish from predation." 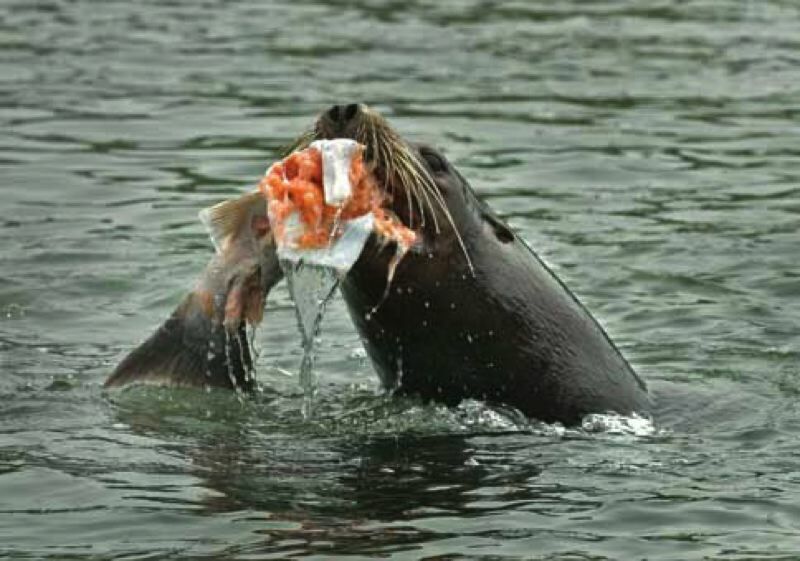 ODFW officials estimate over 25 California sea lions — along with an unknown number of Steller sea lions — continue to prey on salmon, steelhead, sturgeon and lamprey in the Willamette River. Biologists estimate that California sea lions ate at least 18 percent of the returning adult wild Willamette winter steelhead prior to March. During the course of five weeks in February and March, ODFW relocated 10 California sea lions to a beach south of Newport. All marked animals returned, ODFW biologists found, with most of the sea lions traveling the 210 miles in less than six days. One was even captured and relocated to the coast twice, but came back on both occasions. Currently the run of upper Willamette wild steelhead stands at 1,338, which is slightly higher than in 2017 but still well below historical runs that often topped 10,000. In contrast, the California sea lion population is exceptionally healthy and fluctuates between 250,000 and 300,000 animals. According to Wright, "Removing these few male animals that have habituated in freshwater would have no impact to the sea-lion population but would provide much needed relief to fish runs and prevent similar crises from occurring elsewhere." ODFW has applied to the federal government for authorization to trap and kill sea lions at Willamette Falls under Section 120 of the Marine Mammal Protection Act. Even if that application is approved, it won't be until 2019 at the earliest. ODFW senior officials are also working with the region's congressional delegation to address the inflexibility of the law to deal with these issues in a more timely manner. "This isn't just about the Willamette steelhead, which we know are in serious trouble," said Clements. "We also know that predation on white sturgeon has increased dramatically this year, and that sea lions are preying on salmon, steelhead and sturgeon in other rivers like the Sandy and Clackamas. Effective management will only be possible if the U.S. Congress changes the law to allow managers to proactively prevent sea lions habituating to these bottlenecks in freshwater." ODFW plans to continue to monitor sea lions on the Willamette. If the opportunity arises, officials will trap and relocate another sea lion or two this spring. The agency is not authorized to do anything other than non-lethal hazing on sea lions that are foraging in the Clackamas and Sandy rivers. Though hazing has proven ineffective in other river systems, ODFW officials may run some hazing operations from time to time on the Clackamas River.